The Small Arms Protective Inserts (SAPI) upgrade the outer tactical vest (OTV) to provide additional protection from rifle-fired threats. The SAPI plates consist of a ceramic plate backed by multiple layers of a non-woven fabric film. The combination of materials produces a plate that can defeat rifle-fired rounds (5.56mm and 7.62mm) while minimizing back face signature. 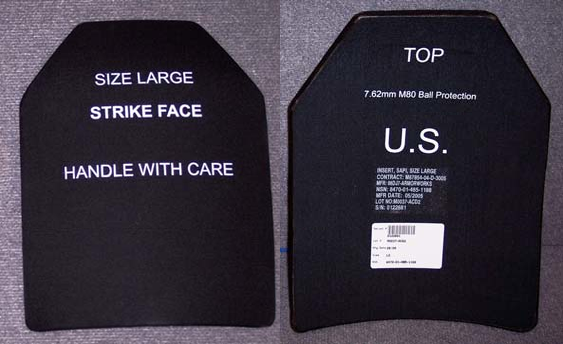 A protective covering prolongs plate life and minimizes spall in the event of a ballistic impact. The complex curvature of the plate optimizes anthropometric compatibility when worn in the front or back pocket of the OTV.